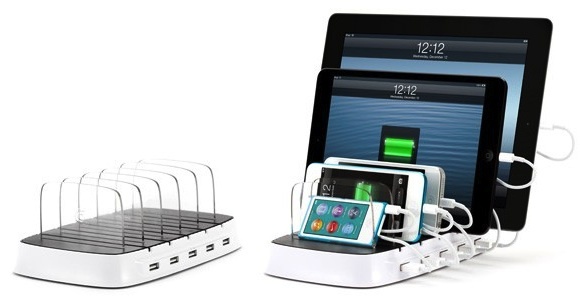 Griffin has started shipping its $100 PowerDock 5 iOS charging station, originally introduced at CES earlier this year. The dock contains USB ports and organizing separators to allow easy charging of up to five devices at once. The company is aiming the solution at families with many devices or small businesses. Each USB port provides 10 watts of power, allowing for maximum charging speed on newer iPads. It doesn't take up much room, about the same as a single iPad. But it gives you a place to store and charge 5 iOS devices at one time, from a single power source. We think it's the perfect charging solution for small offices or work groups, or a family full of iPhone users. The PowerDock 5 is available from Griffin's website for $100. What am I missing here. A powered 5-port USB hub with plexiglass separators for $75 price premium? This would be great if it was (somehow) actual dock connectors and you could just drop devices in *click* but all I'm seeing is some transparent props to hold things up. So what exactly makes this an "iOS" device charger? Couldn't I just plug in Android mini usb cables there? It doesn't even come with lightning cables..
Ummm No thanks!!! $100 plus and additional $20 for each cable you don't have. 2. It's 10 watt power where the iPad 4 comes with a 12 watt power adapter so it will charge slower on this strip. I don't know about the $50, but you're right! TOO EXPENSIVE, for a plastic cradle with 5 USB ports, that are underpowered for the latest iPad. Waiting patiently for Monoprice knock-off. i.sound has been making these for years and they work great. why is it that only huge companies that have close relationships with apple get publicity for products that have been in the marketplace for a while now? like tile, there have been gps trackers with apps that do exactly what tile does for a long time, but just because they have a pretty video with a pretty girl and turn to kickstarter instead of financeers they get publicity and the others don't? sorry to vent, more curious than anything else. Has anyone here actually looked for a hub/charger that can charge 5 iPads at 2.1 amps? There isn't one. All the reasonably priced chargers are usually only 2 max and all the hubs are extremely underpowered and will only trickle charge. As for the separators, it's a great solution if you have cases on your iPads. Most of those drop in and "click" solutions don't work with a case. As for the cables, yeah that's going to be messy but there are not too many solutions if you have a mixed 30 pin and lighting connectors. I've been waiting for this and I put my order in. For you naysayers, good luck finding a better solution. There are a couple of models of this from Cooper, not sure what the differences are. Mine is actually slightly different, having a round LED instead of rectangular. This is a dual 3A charger built-in to a duplex wall outlet. Both iPhone and iPad can be charged faster than with the stock Apple chargers, and I've verified this. I have one in grey on my kitchen (on a split-level island counter - the iPad is always sitting on the counter...) and love no longer having an iPad charger sticking out over my counter. SmartHome has just shipped me 2 more in ivory and one in light almond for two bathrooms and a bedroom. Looking forward to getting rid of the rest of the plug-in chargers! I thought ahead, and my master bath has a GFI in the usual location on the back wall behind the counter, but another chained outlet on a side wall between some shelves (so items may be placed on the shelf to charge) and even one inside a large pull-out drawer (toothbrush...). Guest bath I will have to enlarge the hole and put in a bigger box to hold two outlets. Will be easy because it's already a retrofit box. iPhone: supplied charger is 1.1A, but will charge at 1.5A, and requires at least 0.5A. iPad: supplied charger is 2A, but will charget at 2.5A, and requires at least 1.1A (so won't charge on a typical USB hub at all). Has anyone here actually looked for a hub/charger that can charge 5 iPads at 2.1 amps? Yes, actually, I have one. I have this becuase I am a mobile developer, and have to test with many devices and keep them charged. You do have to disconnect it from your computer to charge an iPad. Not sure what that is about, but guess it has something to do with USB protocol. If you disconnect the USB from your computer, it can charge at up to 2A, which accomodates the maximum for iPhone (and more than the supplied charger) and matches the standard charger for iPad (though iPad will charge at 2.5A). So, at least I can unplug from my Mac Mini and charge a bunch of devices over night, and also leave a bunch of devices plugged-in and save wear and tear on connectors.